It’s been a busy week here at the ranch — firewood stacking, crop research, ag meetings, field scoping, forest exploration, water permits. The kinds of things that don’t wait for you, even if you ask nicely. I had enough time to squeeze in my pony rides, but found myself feeling a little melancholy and missing Murray. Most of the time I’m just fine — and sometimes I’m probably inappropriately cheerful — about Murray’s retirement. Obviously I don’t wish we’d been sidelined by nine (well, ten). I know it was the right decision, and I know that this doesn’t signal the end of me riding or showing or doing fun and amazing things with horses. Maybe even horses who cross tie and tack up easily — who knows! But last week? I had the morbs. But — shocker — that’s not how it went. I started thinking about leasing another horse in the barn. A horse sized horse. 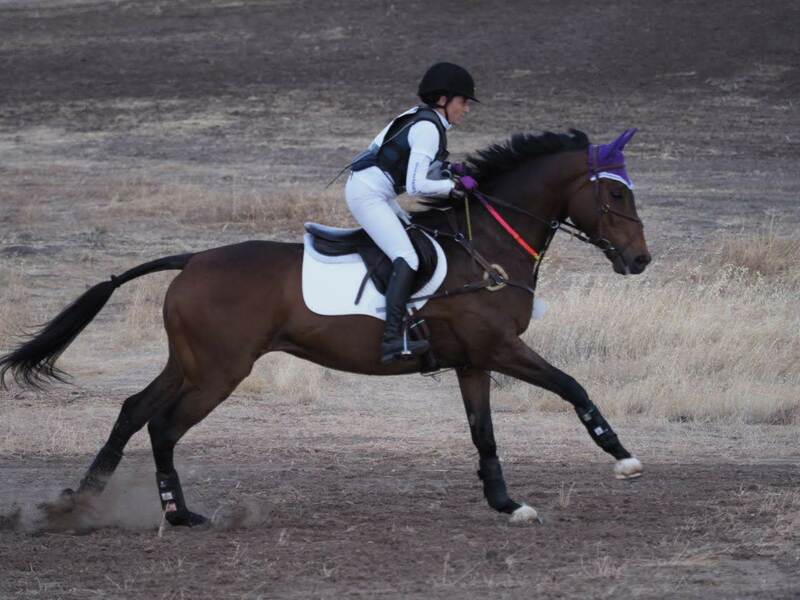 Who has dressage training and has competed at training level and, well, goes on the bit. Murray wasn’t perfect, but I had a path and a plan for him. I knew where I was going in his dressage training and, for better or worse, I intimately knew what his training holes were. And I was pretty optimistic about the places we could still go. There was plenty of fun left in our relationship, even if we weren’t jumping the biggest fences or galloping at break-neck speeds. Plus, he taught me SO MUCH. He taught me how to be patient — like, really patient — and creative. He totally enabled my obsession with continued learning and animal behavior. And he was fun to ride! Minus being lame, the last year and a half or so were so much more fun than struggle. He wasn’t everyone’s type of ride, but I loved riding him. I miss learning with him, and playing with him. I miss laughing at his ridiculousness, and telling absurd Murray stories to my friends. It’s a funny feeling to simultaneously know that a horse wasn’t the right horse for me and yet to deeply, thoroughly appreciate him for all the lessons and learning. To be glad that you don’t have to deal with spookiness and flightiness and stupid tacking-up dances and miss him terribly at the same time. A couple of weeks ago I was catching up on The Eventing Radio Show, listening to old episodes from last year. Joe Meyer, who I love as a host and a rider, made the throwaway comment that he wouldn’t mind competing out here on the west coast because everyone does so well in dressage out here. It was meant as a joke, but it piqued my interest anyway. I have definitely complained with my west coast friends about the “easy” dressage judges out east, and I’m sure people in Texas are laughing at both coasts. But who is right? This, it turns out, is an easy enough question to answer. So I took to Startbox and Event Entries and scraped for data on dressage scores. Then I fired up R Studio and went on a big fat fishing expedition (research slang for exploring a dataset for relationships instead of testing specific hypotheses). The short answer? There’s no difference in average dressage score between the East and West coasts for FEI events. There are hundreds and hundreds of events held across the US every year, and usually a few hundred people at each of those events. 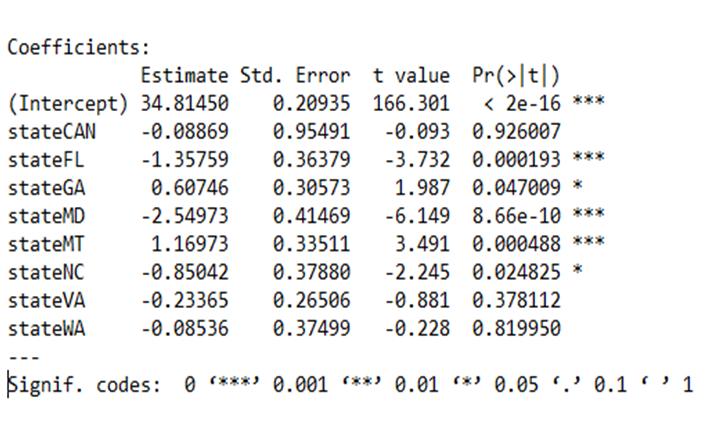 So to save my sanity when scraping the data, I stuck to rated events that offered the FEI levels. A few USEA-only events slipped through the cracks because I’d already opened the event and at that point, it was easier to just copy that data. I tried to get an even representation of events across the year and across the country, but of course there are more events on the East coast than anywhere else. I ended up with a little more than 5,500 rider records before I called it quits on copying and pasting and reformatting. For each rider record, I included the division, venue, date, state, area. I included columns that allowed me to pool similar divisions that aren’t exactly the same (CIC 2* and CCI 2*, or training and training 3-day). I also included whether the level in question was USEA or FEI rated. I didn’t include any multi-level effects for for rider or dressage judge. Laziness was not the only reason for this — by ignoring the influence of the judge (for now), I could (kindof) see if the effects across different areas had to do with riders or judges. If the same 5 judges worked at every event across the US, then we’d expect their scores to be very reliable, and differences from coast to coast would have to do with rider differences. Of course there’s many more than 5 judges and these effects wouldn’t be so obvious, but you can see what I’m getting at. Mean dressage score in the US? 34.756. Standard deviation is 5.19. 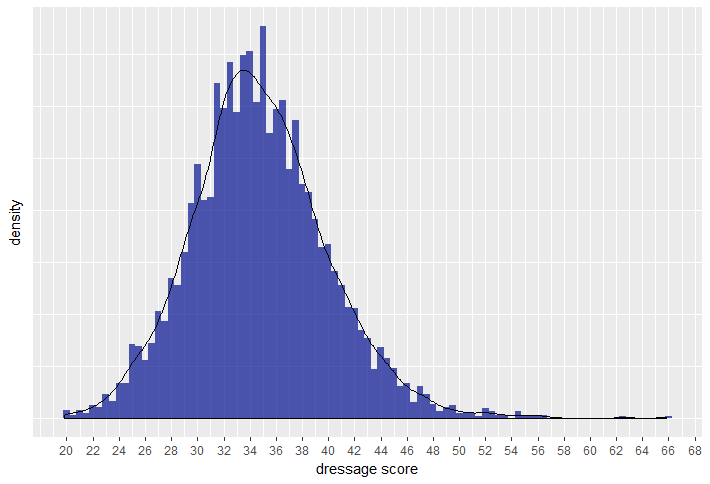 This is the density histogram of dressage scores across all levels. You can see that though the mean is 34.756, there is a peak in scores after that — right around a nice even 35. So there you have it. That’s the average dressage score at (rated) events across the US. If you’re trending below a 35 you should feel chuffed as you’re doing better than most! When you score below 30, you’re doing better than about 85% of the country. Below a 25, and you’re doing better than ~97%. Down below 20? You’re the 1%!! Mostly, I was interested in exploring the differences between the coasts, USEA areas, and states to see if dressage scores varied significantly from place to place. And for the most part, the differences weren’t stark or necessarily significant. You can see this reflected in the density histogram at the top of the post. 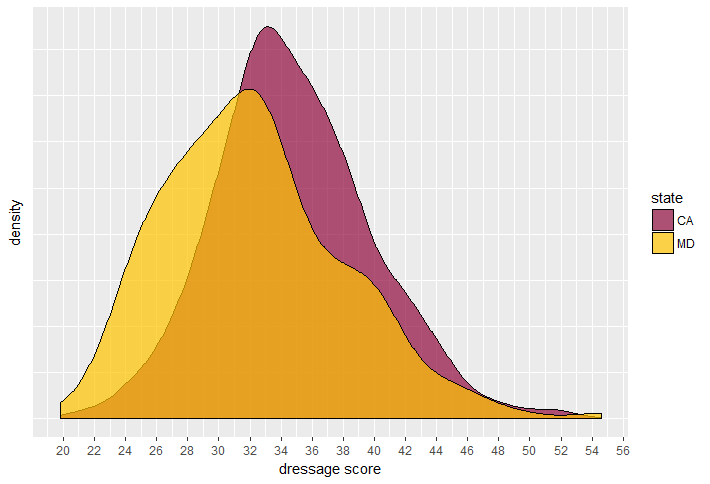 There’s a lot of overlap between the dressage scores of east and west coasts at the FEI levels. But how do the USEA levels stack up when you compare things from coast to coast? Well, things aren’t quite so tidy. Let’s do some stargazing (those asterisks are typically thought of as good things in stats land)! For events only sanctioned by the USEA, there east coast has a significantly lower average dressage score than any other area. Riders in the middle of the country (basically Montana) are scoring nearly 2 points more, on average, than riders out east. People in the south get about 1.4 points more, and out west we get a measly 0.7 points more. It’s important to note here that the “points” I’m talking about are percentage points, not raw points on tests. Let’s break this relationship down a little more by state, shall we? In this case, the intercept state is California. And what we see here is kinda neat! West coast states seem to line up (ish) in terms of scoring, which makes sense because they would probably pull from a very similar pool of judges. The second row in the table is Canada (from Bromont’s results). But start comparing to the east coast, and we start to see some differences! Florida and Maryland in particular appear to be preeeetttyy generous with those dressage scores! 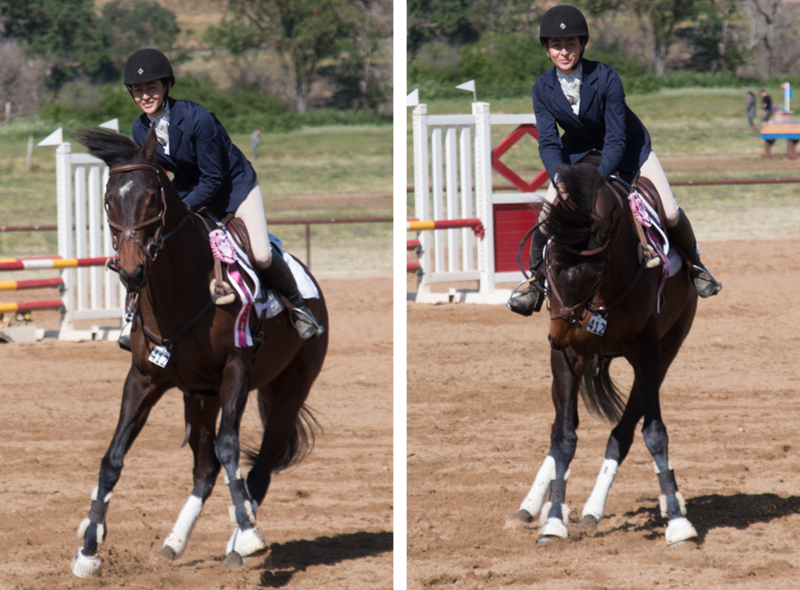 Riders in those states score 1.36 and 2.55 points better on average, respectively. On the other hand, Montana is out there hammering their riders with dressage scores an average of 1.17 points worse than in California. Because I’m California-centric, I plotted the distribution of scores in the lowest-scoring state (Maryland) vs. California, to show what a significant difference here looks like. It’s not a HUGE split between the curves, but you can see that there are quite a few more riders in Maryland in the sub-30 zone than you see in California. 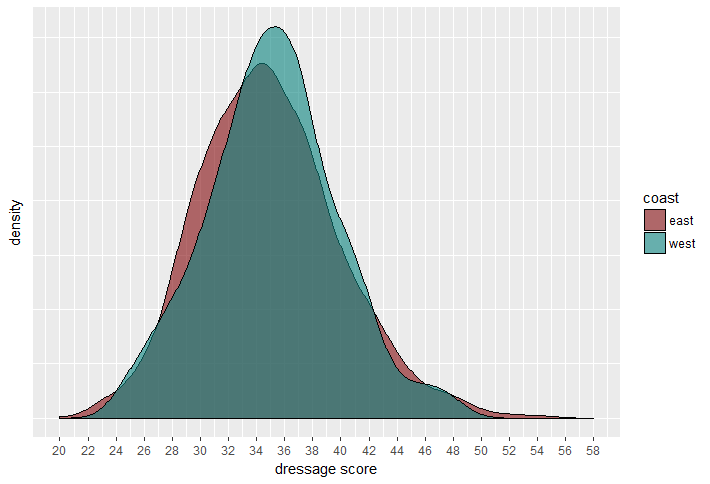 There could be lots of reasons that I found significant differences between the dressage scores of different states and areas. For one, I didn’t apply a single correction for multiple tests to this data set, and I explored tons and tons of potential relationships. Statistically speaking, one of them was bound to come up significant. Could it be that riders out east are just better than riders in other states? Ummmm. I mean sure, this is one possible answer. But given the variance between states up and down the eastern seaboard, I’m not sure this hypothesis holds up. It’s also possible that judges on the west coast and in Montana are much harsher and stricter than on the east coast. I’ve heard people say that it’s hard to “make it” in dressage in California because there’s such strong competition down here in the form of Steffen Peters and Hilda Gurney. Perhaps the presence of Olympic-level riders makes judges more strict? If so, one would expect a similar effect in Florida. And… well, the data doesn’t quite hold up to that either (but also isn’t designed to answer that question). It seems like there might also be some hyper-local effects on the east coast, since it’s so densely populated out there. This might be due to the fact that judges out east don’t need to have a very wide travel radius in order to judge plenty of shows. If those judges tend to score a little better, then that would create pockets of shows where scores are a little more generous. Anyway, there’s lots of potential reasons for these trends. I just enjoyed looking at them! What I can pretty confidently say is that for 2018 at least, riders in California were not getting preferential treatment from dressage judges (erhrrm, Joe!). Some choice nuggets of wisdom from Mary that I found scattered throughout my notes. Got it, lost it, got it, lost it, got it, lost it, got it, lost it — this is the process of learning. On change: it doesn’t take long to change your perceptions. Close your eyes. Hold your arms level. Now raise one arm up 45* and the other arm down 45*. Hold them there for ten seconds or so. Now, with your eyes still closed, bring your arms back to level. Open, and observe the difference between the heights of your arms. 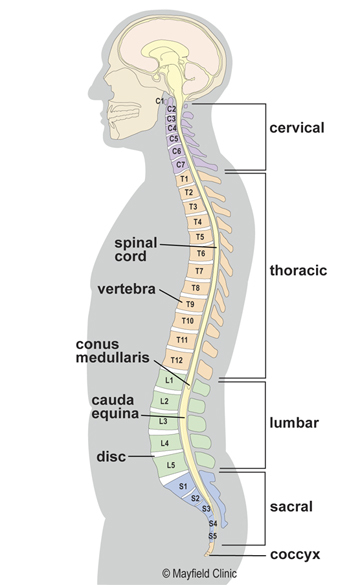 Most people will have brought their arms back to a quite uneven “level”. Just ten seconds with your arms at different heights changes one’s perception of “level”. “I have to do it right,” blocks you from learning. 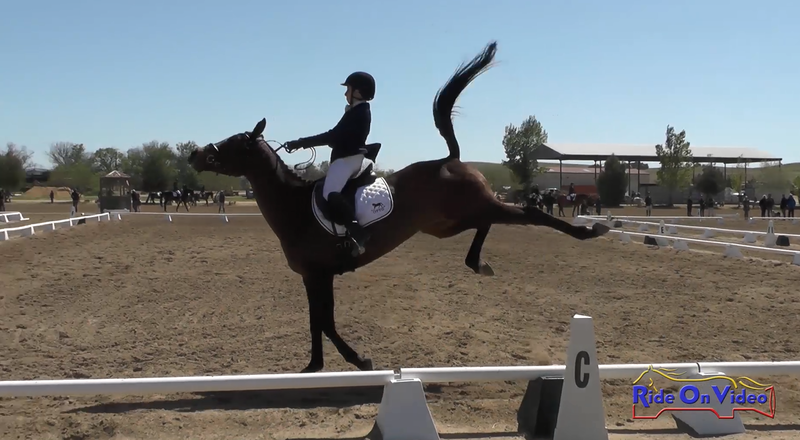 Dressage is an experiment. It’s not always about doing it right every time and never doing it wrong. Give yourself the freedom to play with your riding, so you can find what is right. The solution becomes the problem. Such is the way of learning. 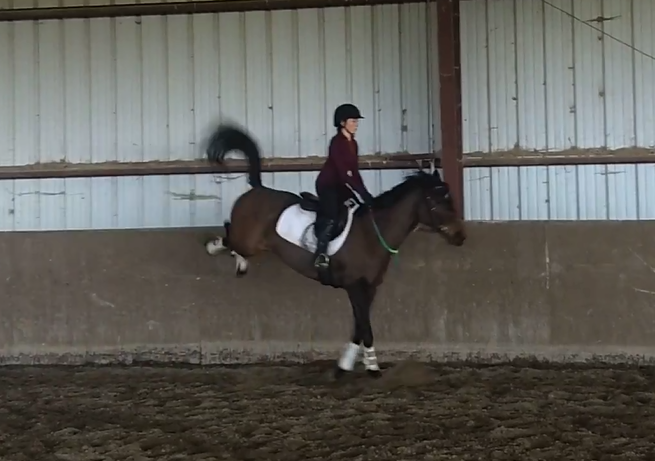 Somehow, getting my horse forward has become a central theme of my life again. I had thought that I would try to establish the whole leg = go, no seriously it means go every time thing early on in my next horsey relationship. I guess I didn’t count on leasing a pony. 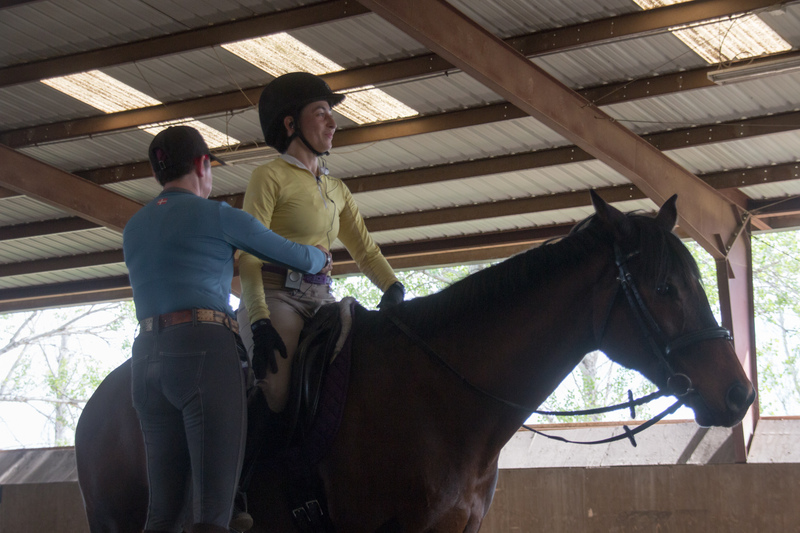 But, I did have a great conversation with TrJ in one of my lessons that helped me figure out a biomechanical problem I’m having, and helped us reformulate our approach to flatwork with young Samwise. TrJ said she had a VERY similar conversation with the son of her trainer when she was a kid. The son said “it easy to solve, just push your leg down every time before you kick!” TrJ evidently tried that for a while. Seems easy enough, right? — jam leg down, kick, jam leg down again — and it turns out that is not actually the solution. I mean, not long term anyway. The crux of the problem: the pony is not in front of my leg. I kick a little, and then I kick a bit harder and maybe squeeze a bit too, then I kick from that squeezing position, and next thing I know my feet are all the way up on the saddle flaps and my knees are at my chin like a jockey. I’m at a slight disadvantage because of Sammy’s size. Because he’s short and rotund, my calf is what contacts his sides the most, and it’s a tad more difficult to make a clear kicking motion with the calf. 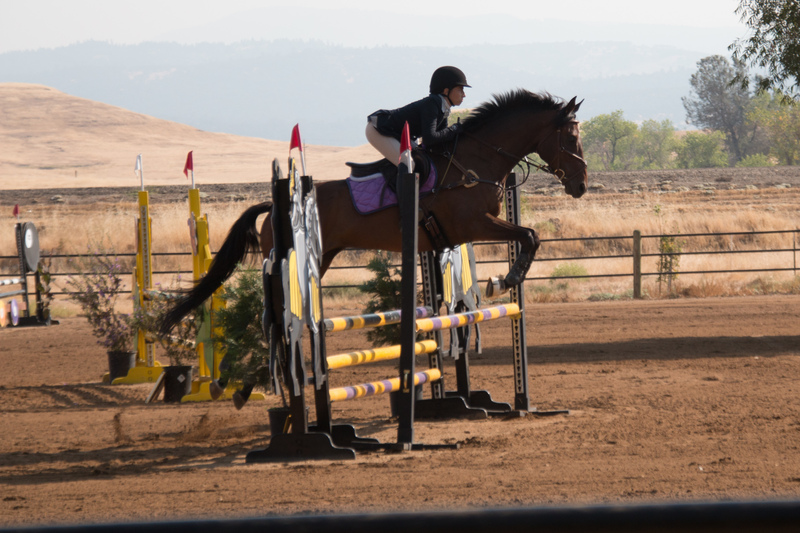 But, TrJ pointed out, there are a lot of really tall riders out there (Boyd, William — she just refers to 4* riders by their first names like we see them all the time, ha!) who have this conformational problem on normal sized horses. However, they have no problems. Why? They get the horse responsive off the leg early. And that makes perfect sense. In jump lessons, we pretty much canter, jump a course, praise the snot out of him, and then let him do what he wants in the walk. And I plan to keep doing most of that, minus the part where the walk becomes the “pony rules time” gait. 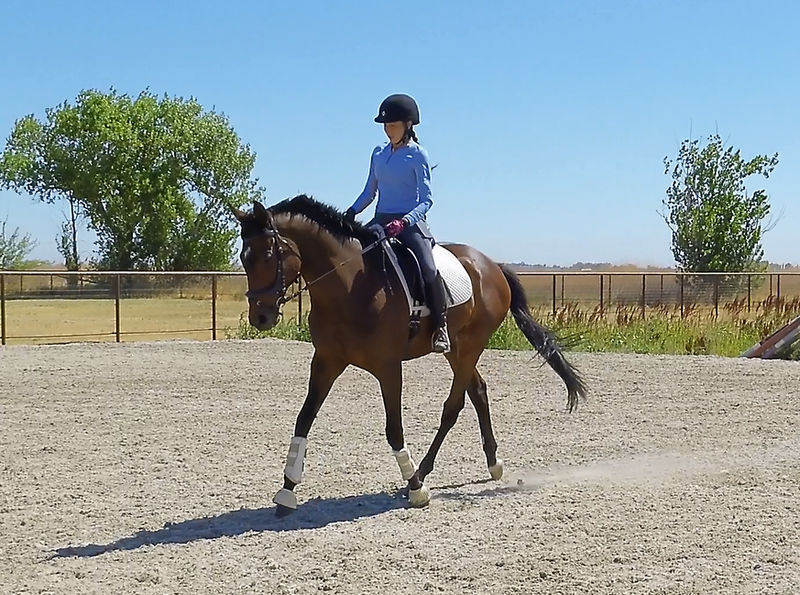 TrJ had me do the very familiar exercise of giving a small kick and if I got no response in a couple of steps immediately following it up with a kick + tap of the dressage whip. We did several circles where I tried to walk for just four or eight steps before coming back to the trot and it was rough. Sammy was like “super, the walk is mine!” so I immediately reverted to shoving with my seat. Once I got my seat still, it was hard not to get yanked down out of the saddle but his attempts to scratch his face. I repeated the exercises on my own during a ride and was really surprised how many repetitions it took for Sammy to start listening to my leg without the whip. 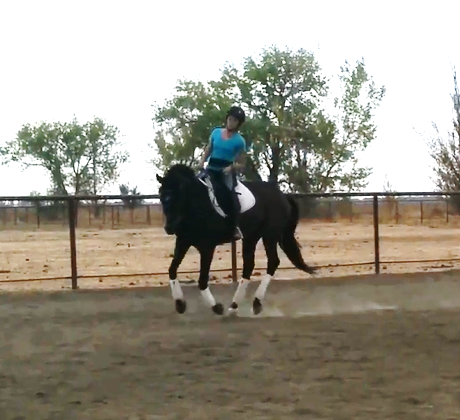 I started the exercise going between trot and canter, because I know it’s a much easier transition for him to grasp. And grasp it he did! Transitions weren’t perfect, but they were there and they were prompt. In the walk I got absolutely tuned out. Like, the second we were walking, I basically didn’t exist. I was maintaining the contact (insomuch as we had a connection at that point), so it wasn’t like I was throwing the reins away and saying “break time” with one aid and “work time” with another. But I did probably 20 or 25 transitions from walk to trot where I needed a light tap of the whip to back up the leg aid. To the point where I was like “oh man, I’m going to have to quit doing this in a second because it’s starting to feel an awful lot like a fight.” Finally, somewhere around attempt 26 I guess, I got a transition into trot just from my leg. It wasn’t super prompt, but it came before I got the whip organized and I was just like YES YES PONY YES and threw the reins away and let him have his head. I did one more transition to trot and Sammy was like “fine, I’ll play your stupid game” and then I practically leapt off and stuffed his face full of cookies. It did not take Murray 20-25 walk-trot transitions to get the idea of this exercise, so I was a little worried about the amount of time it took Samwell. But it turns out the pony is a clever little cookie, and I haven’t had to have the discussion more than one time per ride since then. So it took longer to stick at first go, but it has stuck much better than with my own horse! Originally TrJ suggested I work on a bit of getting Sammy forward and a bit of getting Sammy to push into the bridle during each ride, and bring the two together as we made progress on each. But they converged way faster than we expected, and getting pony forward has resulted in much better interest in stretching forward and down. So now I get to work on both at once, which is obviously so easy for a unitasker like myself. And for those of you who sometimes feel like you’re climbing rope when riding your horse, I have an exercise for you….